Why billets & darts are made of tungsten heavy alloy? As we know, the barrel forms the main part of darts. Nowadays, tungsten-based tungsten alloy billets are widely used as the standard tungsten barrels material, for it has a specific gravity of 19.3(20℃), making it a very dense material with small volume. Besides, it has superior wearing resistance, well machinability, etc. Tungsten alloy billets for darts is quite difficult to be manufactured as 100% tungsten. Therefore, in fact, the all tungsten darts in market are made of tungsten alloy. Engineered for a greater weight to volume ratio, tungsten alloy darts have a characteristically slimmer barrel. Due to these special properties, tungsten heavy alloy is now widely applied in the making of darts to replace brass. Standard	material	for barrel is tungsten heavy alloy, and barrel forms the main part of tungsten darts (mainly used in sports). Tungsten has a specific gravity of 19.3(20℃), so it is a very dense material. For its special properties, nowadays tungsten is widely applied to make darts replacing brass. Because of technical difficulties with manufacturing, a 100% tungsten dart is not available. All tungsten darts you can buy are in fact made of tungsten heavy alloy. 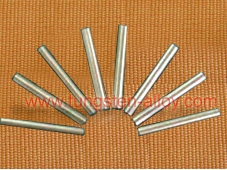 We could supply tungsten alloy billets by various sizes and contents, popularly 70~90% tungsten is used for making both soft-tip and steel tip barrels, ranging from 14~18 gram and 18~40 gram respectively, and sometimes, 65% and 95~97% tungsten are offered following customers’ specific request. 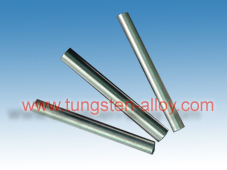 Tungsten billets are actually tungsten cylinder rods after surface grinding by center-less processing, and their weights are varied from different tungsten barrels contents and rod sizes. For more information and pictures about tungsten darts & billets, tungsten billets and tungsten barrels, please click chinadart . you can contact us by telephone 86 529 5129696, or email: sales@chinatungsten.com sales@chinatungsten.com .